Situated in Greetsiel, this hotel is within a 15-minute walk of Greetsiel Twin Windmills and Lower Saxony Wadden Sea National Park. Pilsumer Lighthouse is 2.4 mi (3.9 km) away. Situated in Greetsiel, this hotel is within 1 mi (2 km) of Greetsiel Twin Windmills and Lower Saxony Wadden Sea National Park. Pilsumer Lighthouse is 2.5 mi (4 km) away. 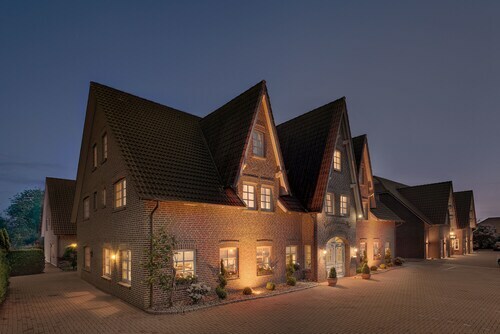 Situated in Greetsiel, this luxury apartment building is within 1 mi (2 km) of Greetsiel Twin Windmills and Lower Saxony Wadden Sea National Park. Pilsumer Lighthouse is 2.5 mi (4 km) away. Situated in a rural location, this romantic hotel is within 1 mi (2 km) of Greetsiel Twin Windmills and Lower Saxony Wadden Sea National Park. Pilsumer Lighthouse is 2.5 mi (4 km) away. How Much is a Hotel Room in Greetsiel? 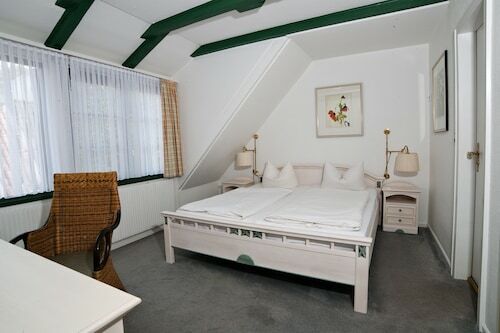 Hotels in Greetsiel start at $112 per night. Prices and availability subject to change. Additional terms may apply. For those visitors who are searching for a place to hang their hat right near the hustle and bustle of Greetsiel, Travelocity's destinations page offers several options. Within an easy driving distance of Greetsiel, there are 4 suitable hotel and apartment options. Do you want to book a convenient spot in the midst of Greetsiel's action? Compare the Hotel Landhaus Steinfeld and Der Romantik-Hof Greetsiel that await you within a short walk of the center of the city. The Nordseehotel Freese is situated 13 miles (21 kilometers) from central Greetsiel. If you would prefer another option, the Upstalsboom Parkhotel can be found approximately 10 miles (17 kilometers) away. 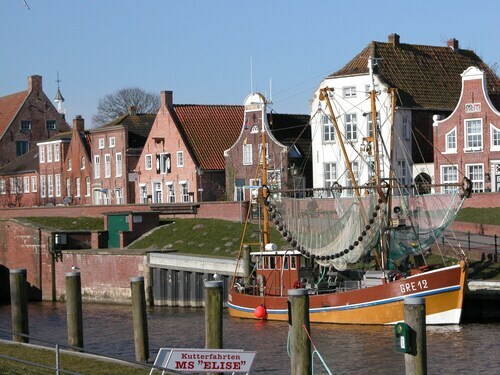 The Hotel Ostfriesland along with the Hotel Bootshaus are two alternative places to base yourself around Greetsiel. The larger Lower Saxony - Bremen area is definitely worth exploring as well. Lower Saxony - Bremen offers beaches, coastal plains and forests, and other commonly visited visitor destinations include old towns and historic mansions. Daring travelers might also engage in snowboarding in the region. Bremerhaven is 60 miles (100 kilometers) to the east of Greetsiel and is where you'll find Zoo at the Sea and National German Maritime Museum. Next time you visit Bremerhaven, check out the ATLANTIC Hotel SAIL City and Hotel Haverkamp. 40 miles (67 kilometers) to the east of Greetsiel, you will reach Wilhelmshaven, which is home to the Hotel am Stadtpark and Friesen Hotel. While visiting Wilhelmshaven, set aside some time to explore the Jade Weser Port Info Center and Wadden Sea UNESCO World Heritage Site. Just because you're taking a break from your usual habits, who is to say you shouldn't expand your love for a day at the stadium. You'll find Marschweg Stadium 50 miles (84 kilometers) to the southeast of Greetsiel. Modern visitors that wish to find a room or apartment nearby can compare the Altera Hotel im Herbartgang or the Hotel Sprenz. Eelde Airport is a major entry point for flying into Greetsiel. It can be found 35 miles (53 kilometers) from the town center. 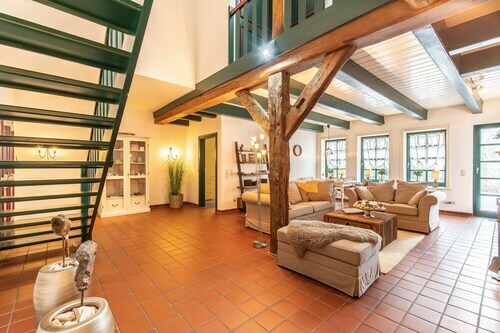 For travelers who hope to stay in Travelocity-listed accommodation nearby, read about Fletcher Family Hotel Paterswolde or Postillion Hotel Haren Groningen. Your Holiday ? With a Romantic View of the First Mill in Greetsiel ?